Preheat oven to 350F and line a standard12-cup muffin tin with baking cups. formed and no clumps remain. Spoon the batter into the muffin cups, about ¾ of the way, and bake until centres are firm, roughly 22 minutes. Let the cupcakes cool before transferring to a wire rack and frosting. While cupcakes are baking, add all frosting ingredients into a food processor and blend until well combined and no avocado chunks remain. Transfer this to a piping bag or use a knife and spread it on to the cooled cupcakes evenly. 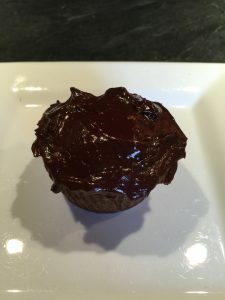 You can also enjoy the frosting as a chocolate pudding and eat it as is for a delicious treat!